Once in a great while you see a company doing what would be sane in other markets, but might be a Herculean improbability in their own. Specifically this has to do with the embedded Linux market, a realm so fragmented that 'chaos' is too polite a description. It is also one of Linux's silent success stories. Odds are that you are within five feet of one or more devices that have embedded Linux inside. Glancing about my office I count three (a printer, a router, and a cell phone, though I suspect the hub and print server at Linux-based as well). The embedded Linux market is fragmented along several vectors. The primary vector of discord is the application. Router makers and printer makers and cell phone makers have different interest and needs with embedded Linux. A while back my neighbors at Wind River were toying with the notion of creating an online community where users in the different markets could share innovations in a non-competitive environment, but that initiative seems to have fallen in the gutter. Ignoring for a moment the unfortunate aspect of having the word 'vista' in their corporate name, the folks at MontaVista have decided that the proper approach to the market is to offer embedded Linux packages tailored to different market segments. They are not tackling the relative industries (routers, printers, cell phones, etc.). MontaVista is segmenting their embedded Linux offering by CPU/platform - Atom, PowerQUICC II Pro, PowerQUICC III, TI OMAP35x, etc. Unlike the x86 server market, where use variations between box vendors are relatively limited, the chip market for embedded Linux is highly fractured. The differences are allegedly significant enough that loading a Linux distro down with cross platform packages is a burden to the buyers. 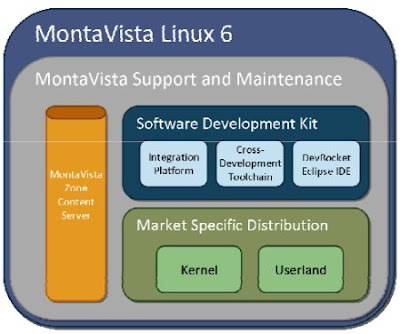 MontaVista claims that many in the market buy an embedded Linux package and then customize it to their platform before using in production. MontaVista is segmenting their product to match the chip-based segment of the market. Now segmentation is a Good ThingTM for marketers to do. What I find curious is that the assembly of a Linux package by CPU is a significant segmentation vector and that it has taken this long for a vendor to segment accordingly. Over at Wind River, they segment based the category of final product in which their Linux will be embedded. There are Wind River Linux distros for automotive devices, networking gear, consumer products as well as several medical and military specs. Instinctively this seems to be the more rational segmentation model. Consumer devices need user interface packages (image a G-Phone without the G-UI). Networking gear doesn't need fancy UIs, but it does need routing and network security functions that a consumer device might not. The method to MontaVista's madness may be in their new Integration Platform (sigh, another use for the acronym IP). Akin to SuSE's openBuild system, the goal is to provide customers with ways of safely and sanely customizing MontaVista's core distro. This saves buyers the pain of finding, including and removing parts of a Linux distro to make it work for the intended application. Here is a contrast in market approaches: Wind River has both a general purpose distro and a string of special builds for different industries. MontaVista has a general distro with some reconfiguration for different CPUs and with a tool to tailor the distro to your specific needs. I'll have to give the short-term nod to Wind River. Business in competitive markets moves fast. Wind River provides products pre-configured for various industries, and yet which can still be tweaked by the customer (or by Wind River) if there is some exotic need. This helps customer get their products to market faster and possibly cheaper. If Wind River were to engineer an openSuse/MontaVista-IP type system for customization, then they would be hitting on all cylinders. The marketing lesson herein is that segmentation is always driven by the customer base, not the convenience of the vendor. Segmenting by industry is a natural for many technology vendors, but it may not be the viable for your products. There are two primary goals in segmenting, which we'll be happy to explain once we land you as a client. Your segmentation model must meet these goals. If you don't then you will embed your company into the ground. Guy Smith is the chief consultant for Silicon Strategies Marketing. Guy brings a combination of technical, managerial and marketing experience to Silicon Strategies projects. Directly and as a consultant, Guy has worked with a variety of technology-producing organizations. A partial list of these technology firms include DeviceAnywhere (mobile applications), ORBiT Group (high-availability backup software), Telamon (wireless middleware), Wink Communications (interactive television), LogMeIn (remote desktop), FundNET (SaaS), DeviceAnywhere (mobile applications), Open-Xchange (groupware), VA Software (enterprise software), Virtual Iron (server virtualization), SUSE (Linux distributions and applications), BrainWave (application prototyping) and Novell.